There’s something novel about how many of our beloved Christmas specials are artifacts of a bygone era. It is rare to see programming from five years ago on broadcast television these days, so it’s heartening to see content from nearly 50 years ago still revived each year, especially given our cultural obsession with reboots and modernizations. However, while the perennial holiday classics—the Rudolphs and Charlie Browns of the world—have been largely spared this ignominious fate, I can’t help but feel that the Muppets have been robbed of their place within this broadcast tradition, in part thanks to… a turn toward modernization. A Muppet Family Christmas, which first aired on ABC in 1987, has effectively been overwritten by the Muppet overlords twice in the past decade, as new Christmas specials (2002’s It’s A Very Muppet Christmas Movie and 2008’s A Muppet’s Christmas: Letters To Santa) have latched onto cheap celebrity cameos and broadly drawn holiday-themed storylines to appeal to modern audiences. In the process, A Muppet Family Christmas has become an artifact relegated to home video, a “classic” that we’re forced to discover for ourselves on VHS, DVD, or YouTube. Yet I can’t help but feel that the strategy deployed with those made-for-TV movies misses what made A Muppet Family Christmas so special. It features no celebrity cameos, and instead of imagining Christmas as a global spectacle, it makes us flies on the wall during a wacky gathering of old friends and new friends (comprising the “family” that stands out in the special’s title). Perhaps this is what makes the special old-fashioned, and thus unsuitable for today’s generation of younger viewers, but it’s also what makes it work as a love letter to the Muppets as a wide-ranging, meaningful part of viewers’ childhoods. The special tells the story of Fozzie Bear’s trip home to his mother’s rural farmhouse for the holidays, a trip he takes with a few dozen of his closest friends from The Muppet Show (whom Ma Bear wasn’t expecting; their arrival interrupts her plans to spend Christmas putting three months of surfing lessons to good use). It’d be a simple setup, except Ma Bear rented out her farmhouse (now occupied by a cadre of Fozzie’s “weirdo” friends from television) to Doc and his dog Sprocket, and the Sesame Street gang happens to be caroling in the area, and there’s a strange-looking hole in the basement that might just lead to a place called Fraggle Rock. If we were to single out the most novel part of A Muppet Family Christmas, this collision of Muppet worlds would be the first thing on the list, and I still get a thrill from seeing all these characters sharing the same space. On the one hand, there’s simply something fun about watching the characters interacting, whether it’s Cookie Monster and Animal realizing they’re soulmates (“That’s my kind of fella” indeed, Animal) or Kermit and Robin wandering into Gobo and Wembley’s domain. Even after seeing this thing dozens of times, I still get a smile on my face when Robin hands the Fraggle pebble to Grover, even though it doesn’t really have a greater purpose, or extend into any meaningful conclusion: It’s just a really nice moment shared between characters who would otherwise be disconnected, a “special” moment that’s a product of this unique situation. At the same time, though, the special also portrays the Muppets as something more than familiar characters: What else is the plot, after all, but a hectic gathering of extended family that spirals into conflict and chaos over the holidays? Haven’t we all had family members get delayed by weather, only to show up on dog sleds in their best furs? Haven’t we all had to face that challenge of figuring out what to do with the rats and chickens underfoot in the kitchen? And who hasn’t had a showing of home movies interrupted by one of the family members bursting through the screen? Though the situations here are ridiculous, it wouldn’t be too hard to imagine versions of these situations happening within our own families. It’s unlikely that Dr. Teeth And The Electric Mayhem performed in our living room, and chances are that no one befriended a talking snowman and tried to start a comedy act, but this special feels like a Muppet-ized version of our own trips to the farm (which were a yearly tradition for me growing up), and that’s one of its most endearing qualities. However, as much as we might relate to the situation, this convergence is nonetheless likely one of the central reasons the special has been written off as a yearly television tradition. As much as the lack of celebrity cameos or cultural references renders the plot of the special timeless, it’s hard to ignore that it brings together these franchises at a distinct point in their existence. 1987 is B.E. (Before Elmo) on the Sesame Street side of things, which makes A Muppet Family Christmas an artifact of a simpler time for the series, in which no single character was so clearly elevated above the others. Similarly, although The Hub currently airs Fraggle Rock every weekday, the cultural cachet of the Fraggles remains limited among younger viewers. (It might well have been limited then, if American viewers didn’t have access to HBO. In fact, I wonder how differently I viewed their involvement growing up in Canada, where Fraggle Rock aired on our public broadcasting system.) Whether we consider these specials as promotional tools for the franchise or as efforts to draw a broad audience during a slower time of year, the evolution and marginalization of those franchises makes A Muppet Family Christmas a tougher sell for networks driven by what’s current and trendy. Screw commercial imperatives for a second. A Muppet Family Christmas may be an artifact, but it’s one worth revisiting, and one that would be a fantastic introduction to a “classic” Muppet aesthetic. Even if kids don’t know who the Fraggles are, and even if they’re confused as to why a cow has a line in “Deck The Halls” when Elmo doesn’t, the special nonetheless resonates as a story about what it means to go home, and what it means to spend time with those you love, perhaps best captured by Kermit’s anxiety over Miss Piggy’s struggles to make it to the farmhouse in time for Christmas Eve. Although one original song appears (“Pass It On,” performed by the Fraggles), the rest of the soundtrack is a collection of Christmas standards that most people already recognize. I still associate many Christmas songs with the versions found within the extended final medley, especially Janice and Floyd’s take on “The Holly And The Ivy” for some reason, and even now that I know it’s from Mame, I still consider “We Need A Little Christmas” a Muppet classic (and will insert “Fozzie, we’re all in a hurry” into any and all versions). While caroling may be considered passé in this day and age, there is nothing more classic than a good old-fashioned sing-along, and the collection of music found here is extensive, and the definition of festive. However, if there’s a single reason this special deserves to be seen more widely, it’s for the brief cameo appearance at its conclusion. 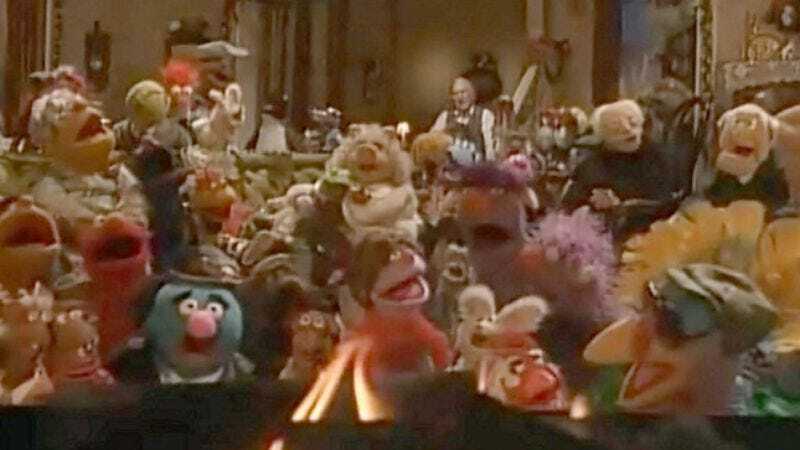 A Muppet Family Christmas was one of the last major Muppet projects completed before Jim Henson’s death three years later, and his appearance at the end of the special (doing dishes with Sprocket while the rest of the Muppets sing “We Wish You A Merry Christmas”) has always been my most vivid memory of Henson’s life. I doubt I had much context for what that scene meant when I was little, but as I grew older, it was as if this one scene was keeping Henson alive as part of my childhood. As evident (though immeasurable) as Henson’s contribution to the Muppets was even before his death, there’s something fitting about Henson looking out over his creations as they celebrate the holidays. Even for those who don’t believe in an afterlife, there’s a spiritual quality to his presence here, and it still gives me chills. It’s sad, not unlike Henson’s devastating (yet also uplifting) memorial service (which, in addition to this special and the tribute to Henson which aired after his death, was the only other time these three worlds came together). And yet in retrospect, it’s a perfect representation of his place at the heart of the Muppet “family.” I wish this special was a yearly broadcast tradition, if only to remind us of Henson’s legacy. Of course, just because the special isn’t on television doesn’t mean that it can’t remain a tradition. The DVD is still available, and the VHS was fairly common before that, which means parents can introduce the special to their children, or children can continue to subject their parents to the special every Christmas Eve (as I continue to do to this day, often in a double feature with Christmas Eve On Sesame Street). But that isn’t an ideal solution either. Given that the home-video releases are substantially edited due to music-rights issues (resulting in some plot holes and some wonky edits), the special as it was originally aired isn’t commercially available, although it has been streaming on YouTube for a few years now. But that isn’t the fate A Muppet Family Christmas deserves. It’s only in 4:3 aspect ratio, and it might look “older” than classic animated holiday specials, and if you were to restore the musical numbers, it would clock in at an awkward 48 minutes (thus confounding current television time slots), but this doesn’t change the fact that a new generation of viewers young and old is missing out on what should be a holiday tradition. Given the centrality of nostalgia to this fall’s The Muppets, it feels wrong that our yearly televisual journey into the Christmas specials of our past doesn’t include this wonderful celebration of both the season and Jim Henson’s imagination. For now, though, I guess it’s up to us to pass it on—just watch out for the icy patch. Tomorrow: A modern Christmas staple you probably didn’t realize originated as a TV special.